Fiddleheads, also known as fiddle greens, are the coiled growing tips of ostrich ferns. They are more often available in spring. The flavor is unique and vegetative, being somewhat like asparagus, green beans and artichokes. The texture is pleasantly chewy. Fiddleheads are reputed to be a good source of vitamins A and C. Fiddleheads are also rich in vitamin K, important to note for people taking bloodthinners. Preparation is simple. The ferns should be rinsed and the stem ends trimmed before steaming, simmering or sautéing. They also can be pickled, but should not be eaten raw. Fiddleheads contain an unknown toxin that causes severe stomach upset bordering on food poisoning. Always blanch, boil, or steam before eating. Fiddleheads should be eaten soon after purchase, although they may be stored for a few days, tightly wrapped, in the refrigerator, if need be. They can also be stored in water in the fridge for up to a week if you change the water every two days. Most of the greens sold as fiddleheads are immature ostrich ferns (Matteuccia struthiopteris) of northeastern North America, which are safe for most people to eat. However, if wild-gathered, care should be taken to ensure that the fiddleheads are ostrich ferns. Cinnamon ferns (Osmundastrum cinnamomeum) and interrupted ferns (Osmunda claytoniana) are often mistaken for ostrich ferns, though easy to tell apart if one knows what to look for. Ostrich fiddleheads are not covered with wool and have a groove running up the stem. Bracken (Pteridium aquilinum) is considered carcinogenic. Fiddleheads must be broken off with the flick of the wrist and never cut, as cutting prevents the plant from regenerating. In preparation for eating, the fiddleheads must be cleaned of their brown-colored silk, which resembles the inside skin of a roasted peanut, but is not tasty. This is most easily accomplished with the aid of a garden hose, and some sort of screening device. Blanching the fiddleheads is a must if they are to be frozen (which the recommended way of storing them, for up to eighteen months) and is also preferable if they are to be eaten immediately. This removes the bitterness from the plant, which can cause stomach upset for some. 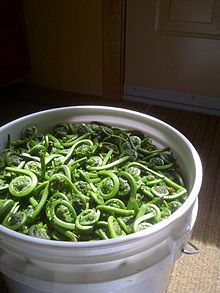 Blanching is done is by bringing the cleaned fiddleheads just to a boil in a large pot of water, and then immediately rinsing them and disposing of the water. One will notice that the water has turned black. After the rinse, either return them to the pot (with fresh water) to resume cooking, or plunge them in ice cold water to stop the internal cooking process, and then place them in freezer bags, and then into the freezer. Cooked fiddleheads are done when they have lost their crunchiness, but not become soggy. This is al dente cooking. Served with real butter, and salt, some people also like to add a little cider vinegar. Their subtle flavor interpolates between sweet, mild asparagus and an un-bitter version of cooked baby spinach. This page was last edited on 15 March 2013, at 12:50.